these cards were issued in two sizes, and in various quantaties per set. a total of six sets are available, sets having 50, 54 or 56 cards. some of the cards, can be found with a different picture. on my 56 card set, i have five additional cards, nos. 18, 25, 31, 38 and 48.
would any collector of these cards, have any knowledge, as to how many other different picture variation in this set. likewise, i have the smaller size 54 card set, with an additional seven cards, with a different picture. Yes indeed. A bit of epic cinema voiceover is called for here. "In a world ..." not noted for regularity or consistency - that of cig cards - this set has to beat the band, take the biscuit, win the all-time gold medal. Once you dig into the area at all, cigarette cards become notorious for often having shorter and extended sets, original issues and later issues, smaller or larger size cards, black, brown, blue, green or purple backs, added text, no text or some text, variations in wording, different issues for different parts of the world, images and artwork wholly or partly shared between brands, or even different companies ... in some cases, you could not design product anarchy much better. And that's the point - there was clearly a lot of happenstance in what got produced. And new or revised printruns (in accordance with market demand, etc.) produced different results - sometimes it appears with whatever colour ink was to hand for the backs! Which adds to the allure of the hobby, though it also adds to the frustration of the collector (especially the completist!). But that (or those?) HOMELAND series .... must display at least half of the above incongruities and variations! The strange thing is, it is essentially a very attractive collection, I think. A huge sweep of geographical, natural, zoological, architectural and cultural views of a nation in an era, presented in a way that even at the time of issue must have seemed charmingly archaic. The very title breathes nostalgia. I still like the collection - mad and maddening as it is. No view in particular I just wanted to bump a fossil thread to the top . 5am , time for some hot buttery toast and a cuppa . Gents - a very problematic issue for the Cricket Card collector - how many do you need? I've always hung onto the Cavander's issues because of the 'Hand Coloured' nature of the cards, with multiples of the ostensibly the same card differing in colour depth and coverage on the fronts and text layout, and in some case different wording on the reverse? I've never been able to understand how, why or what cards were issued, Blue/Black writing on the reverse, Medium/Small sized, with Army Club branding/with Cavander's branding & then the real puzzle with/without 'Hand Coloured' centred and right justified! Best of luck and you do have a definitive listing of them so that the cricket component could be understood I'd love to see it. I also am not certain if the same problematic issue exists with the Camera Studies series or whether they only issued the one cricket themed card in both sizes! #48 Horsemen to right of coach - Horsemen disappearing to left. Peter , fully agreed that the main board is slightly confusing and as you state most things happen on 1 thread . What I do find unusual is a lack of a permanent links page so info is readily available to members , lurkers and the casual visitor . Its a great way of building bridges to other like minded sites . As ever, Steve F speaks a lot of sense and with a good (broad) grasp of the topic, following in the footsteps of the well-informed and bewildered fossil at the top of the thread. And expresses the understandable view that in such crazed circumstances, it might be best to hang on to every card. Cigcardpix2 summarises the detail of the many variants very neatly. I hope to post something more on this series (or rather, this anarchy of series) shortly. For the moment, here is a follow-up to the posts just mentioned. If I understand him right, Steve asks for a bit more specifically on the Cricket card (#29). 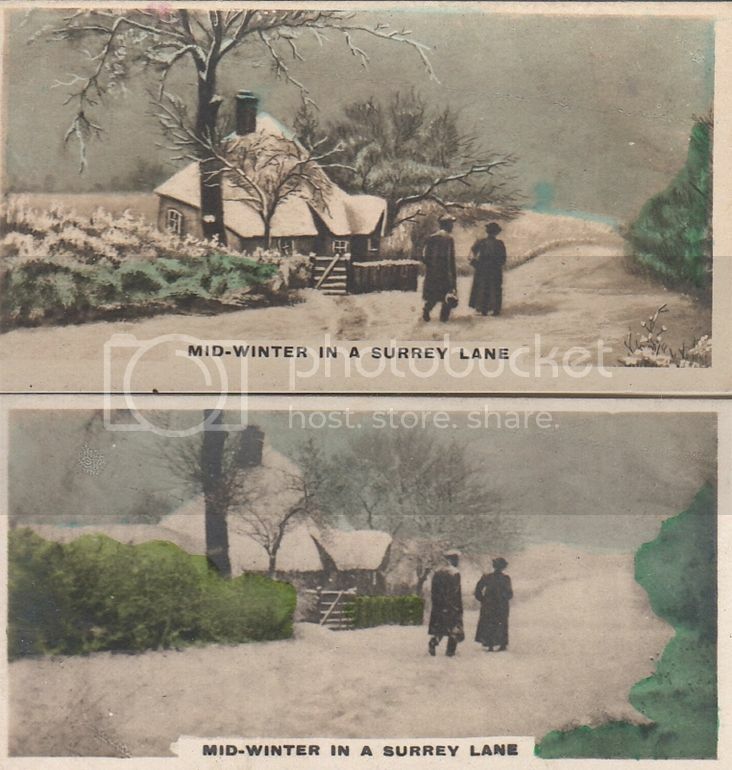 The top two are clearly the same card, but illustrate together how wide the variation in tone and colour flooding (saturation, bleeding) a single card can be with those early (hand-coloured RP) Cavander sets. The third card is a different story. 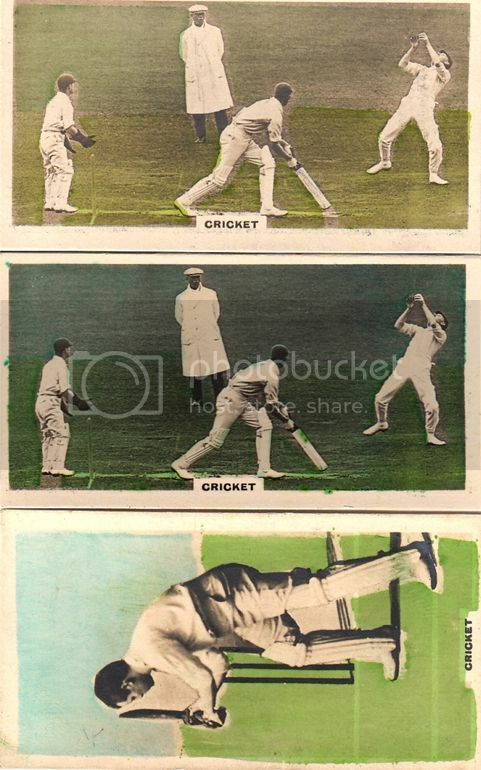 (For those with a cricket history interest, I keep thinking the batsman in the common variant 1 is Douglas Jardine of OU and Surrey - really his slightly stiff stance! - and in variant 2 Jupp of Northants. But probably both wrong!) I should point out that the second variant has a blue (text) back. I have all the other variations ccp2 mentions, though I have only one blue back (the "Jupp") and also one larger-dimension version, of #29 ("Cricket"), which is the "Jardine" as I called it. I don't have the text variations for 1, 34, 49, mentioned by ccp2, and wonder how radical these are? I like this thread and have always liked the cards of Cavanders for the very reasons given for the frustration. Have never tried to solve the puzzle which is perhaps unsolvable so kept them all. They have tended to be not considered attractive and popular with collectors hence relatively cheap. I know they are common but not as common as some cards more expensive, therefor desirability. Haven't described myself before anything other than a collector but now can give myself another title " A completest"
PCS - it seems you speak from the heart as well as far as Cavander's cricket themed cards are concerned! As yet I have not discovered an Army Club version nor any with the 'Hand Coloured' Text missing and subsequent REAL PHOTOS justification varieties. Does anyone have any proof that these do/don't exist? 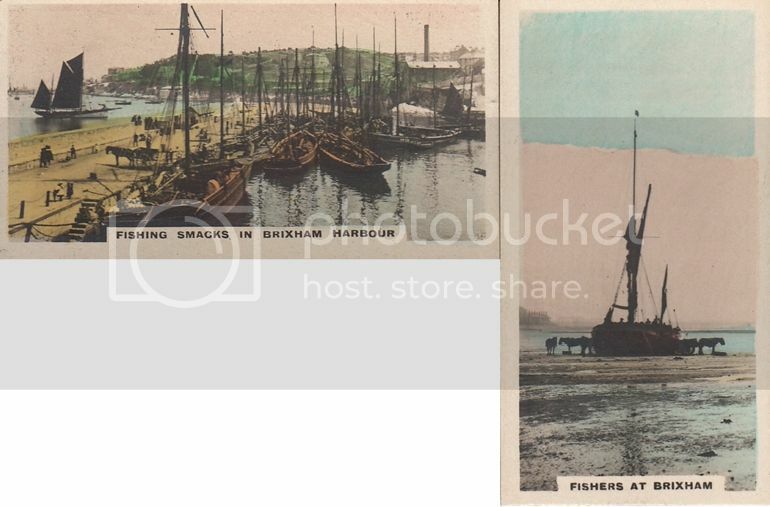 Hopefully I am correct with this one, but it appears that the Medium sized cards have no varieties (apart from the hand colouring) and come with only one back (b. above) i.e. THE HOMELAND SERIES Hand Coloured REAL PHOTOS header caption, with CAVANDERS LTD footer caption in Black Text (g.), while the Small (Normal) sized cards come with the same message format but the reverses are also in black (h.) and blue text (i)! I trust this is correct and if so, I'd suggest that apart from the hand colouring and reverse text layout variations there are NINE different cards as a nominal 'base set' to collect to have all the cricket card permutations and combinations! And I haven't even begun to investigate the Camera Studies set which could potentially have similar variations, but I would be most pleased if someone could confirm this is not the case! There are so many intriguing elements to this demented Frankenstein's monster of a collection!